A virus, known as the Nanobyte has infected hardware around the globe rendering all systems useless - gaming is dead. The HoPiKo, who ran the games, have been enslaved... It’s time to hook up your power gloves and save your HoPiKo brothers! HoPiKo is an intense speed run platformer where you get to save gaming. Jump from platform to platform avoiding death, exploiting shortcuts and ripping through 100s of hand-crafted levels, each one dropped into a 5-stage mini run designed to break your mind! Compete to be the fastest in the world with time based scores, level pars and collectable retro consoles opening unique bonus runs. Fast and brutal twitch-based gameplay. Awesome chiptune soundtrack written and composed on authentic hardware. Uses every ounce of your muscle memory. Unique minimal controls, you’ve never played a platformer like this! 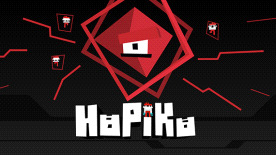 HoPiKo developed by Laser Dog, published by Merge Games Ltd. © 2016. HoPiKo and Laser Dog are trademarks or registered trademarks of Laser Dog Games Ltd. Merge Games is a trademark or registered trademark of Merge Games Ltd. All other trademarks, copyrights and logos are property of their respective owners.